Pictured at the event in the Europa Hotel, Belfast, were members of the North and West Coast Links Group. 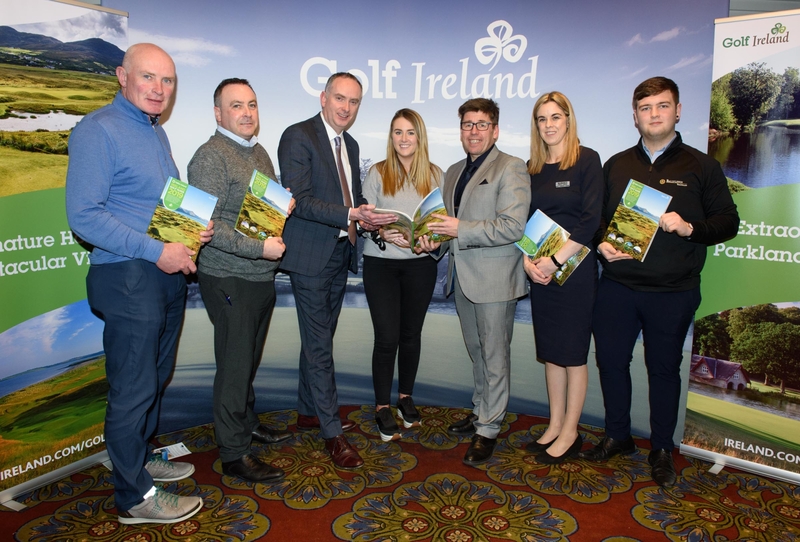 Donegal golf clubs and local businesses joined Fáilte Ireland in Belfast this week to showcase the best of Irish courses to golfers from Northern Ireland in a bid to grow visitor numbers from the North. As part of this work, the National Tourism Development Authority held its annual ‘Golf Ireland’ event on Thursday night with over 40 exhibitors from the finest golf courses throughout Ireland and more than 420 golfing enthusiasts attending from Northern Ireland. Annually more than 200,000 overseas visitors play golf which contributes almost €270m to the Irish economy and accounts for over 1.7 million bed nights. Paul Mockler, Head of Commercial Development at Fáilte Ireland, said: “Golf plays a significant role in Irish tourism. Golf visitors typically spend three times more than the average tourist, with most of their spend going directly into local economies. "More than that, the spread of golf courses around the country offers a significant opportunity to boost visitor numbers and drive tourism growth outside of the better-known tourist hot spots. The following businesses from Donegal joined Fáilte Ireland at the event in Belfast: Abbey Hotel, Arnold's Hotel, Ballyliffin Golf Club, Ballyliffin Townhouse Hotel, Donegal Golf Club, Harvey's Point, Inishowen Gateway Hotel, McGrory's of Culdaff, Mulroy Woods Hotel, Portsalon Golf Club, Redcastle Oceanfront, Golf and Spa Hotel, Strand Hotel and Letterkenny Golf Club.